This map reflects the most common flight patterns at Fort Lauderdale-Hollywood International Airport, which is when there is an easterly wind. Take-offs are the blue lines and landings are the red lines. Broward residents complaining about earsplitting airplane traffic are finding little relief in a new airport noise study. 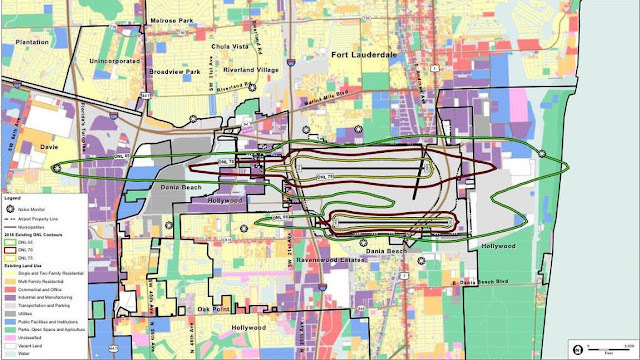 The draft report for Fort Lauderdale-Hollywood International Airport shows where noise is reaching unacceptable levels and — according to the report — it’s not in many of the neighborhoods where complaints have been the loudest. The noise study is the first in 25 years for the airport, providing a fresh look at sound issues generated by the airport’s increased traffic and its new and expanded runway configurations. Residents under the flight paths have been waiting for the study, hoping it could be used to persuade federal aviation officials to make changes that would keep the noise away from their homes. — It relies on computer modeling using flight track data and projected sound volumes to determine noise levels rather than actual, monitored sound levels around the airport. — It averages noise levels over an entire year and doesn’t consider seasonal flight patterns that can bring prolonged noise over some neighborhoods for weeks or months at a time. When the flights are overhead, there’s no getting away from the noise, said Helga Long, of the Royal Palm South neighborhood in Plantation. 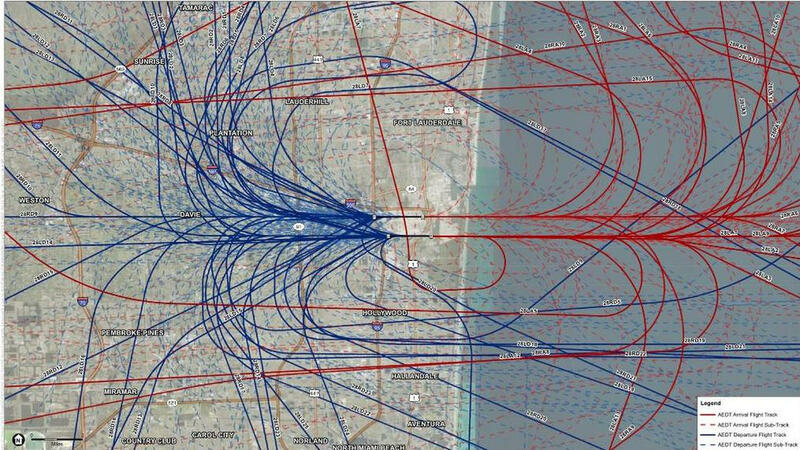 This diagram in the Part 150 noise study shows a year's worth of take-offs (blue lines) and landings (red lines) when the prevailing wind is from the west at Fort Lauderdale-Hollywood International Airport. Long’s community is west of the airport to the north of Interstate 595. Neighborhoods along that stretch are affected more heavily in winter as seasonal westerly winds force planes to take off to the west. Many of the planes bank to the northwest, over the neighborhoods, before heading to destinations up the east coast. Michael Arnold, senior vice president of the ESA firm doing the study, said all its parameters are established by the Federal Aviation Administration. So, despite heavy complaints from many communities, FAA rules require noise studies to look at sound levels over an entire year, Arnold said. That’s why the noise maps don’t show Long’s neighborhood as needing attention, he said. Westerly takeoffs make up only a fifth of all departures from the airport, the study says, so their noise impact is greatly minimized when averaged over a year’s time span. The annualized noise levels factor in the much larger number of days in the western communities when there was no airplane noise overhead, Arnold said. South Florida’s prevailing winds are usually from the east, with planes taking off to the east and over the ocean. The normal procedure is for planes to take off facing into the wind. Plane landings from the west are less of an issue for the communities along I-595, residents said, because they follow a more direct path from the west as they approach the airport, putting them over a largely industrial area. This map outlines areas with severe noise issues near Fort Lauderdale-Hollywood International Airport. The green outline represents annualized sound readings of at least 65 decibels, the maroon outline is at least 70 decibels and the yellow outline at least 75 decibels. Consultants will now take data from the report (called a Part 150 study), have discussions with FAA officials about their reasons for using the current headings for arriving and departing flights and develop recommendations for federal authorities to review. The recommendations can include changes to flight paths, altering land use designations so homes aren’t built in high noise areas and other noise abatement or noise mitigation practices. The process won’t be completed until sometime in 2020, Arnold said. But Arnold said people with noise complaints outside the high-decibel areas identified in the study won’t likely see any relief. “Nothing that we can recommend in the study is likely to benefit them,” he said. The study is looking at all potential noise-affected areas. That includes those to the east — and others to the west south of I-595 that are greatly affected by takeoffs and landings on the airport’s south runway. Broward County isn’t unique with its noise problems. The FAA has changed flight paths for “safety and efficiency” reasons across the country, affecting neighborhoods previously not plagued by noise. Fort Lauderdale is hoping to use the experience gained from other cities to make sure flight paths steer clear of its heavily residential areas. On Tuesday, city commissioners hired the Kaplan, Kirsch & Rockwell law firm that successfully challenged FAA policies at Phoenix’s airport in 2017. The city also plans to hire an independent airport noise consultant to help in its dealings with the FAA. Sorensen said the city needs to keep its eyes on airport flight patterns because the FAA is also doing another study, called Metroplex-Florida, which is assessing the state’s heavily trafficked routes. Any changes from that study are at least several years away. “What we don’t know is what impact [it will have]. It could be a positive impact, more favorable headings, or it could be the opposite,” Sorensen said. 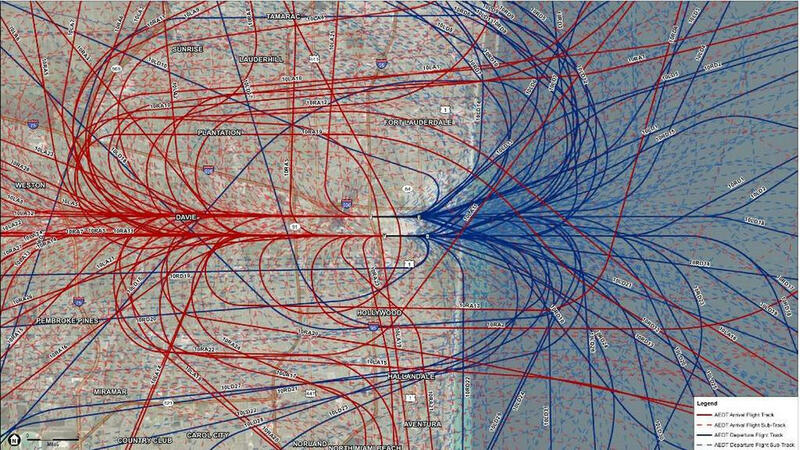 This diagram shows where complaints were received about airplane noise connected with Fort Lauderdale-Hollywood International Airport for 2017. Sara Nichols, of Lauderdale Isles, said the solution to the noise affecting her Fort Lauderdale community is simple: Move the westerly departures that have been banking to the northwest back to the more due-west heading that was used more frequently in the past. The planes would go farther west before turning to the north or south. Another Lauderdale Isles homeowner, James Patterson, said consultants should look to a solution used in California at the John Wayne Airport in Orange County. Planes there rev their engines to achieve quick acceleration, he said, and then take off at a sharp angled ascent so they quickly achieve high altitude to reduce the ground-level noise experienced in nearby neighborhoods. “With the extreme angle of attack, it allows the noise to get way above the homeowners and allows them to enjoy peace and quiet,” Patterson said. The rapid ascent proposal is the type of noise abatement that could be considered for recommendation in the Part 150 study, Arnold said. Consultants would have to show the procedure would be beneficial in reducing noise for people in the identified high-noise areas and not just those farther out looking for some relief, he said.